Rare and extremely difficult to find! This collector's edition Shinwa Shirasaya offers a powerful, full-tang Damascus steel blade crafted in the traditional Shirasaya design. 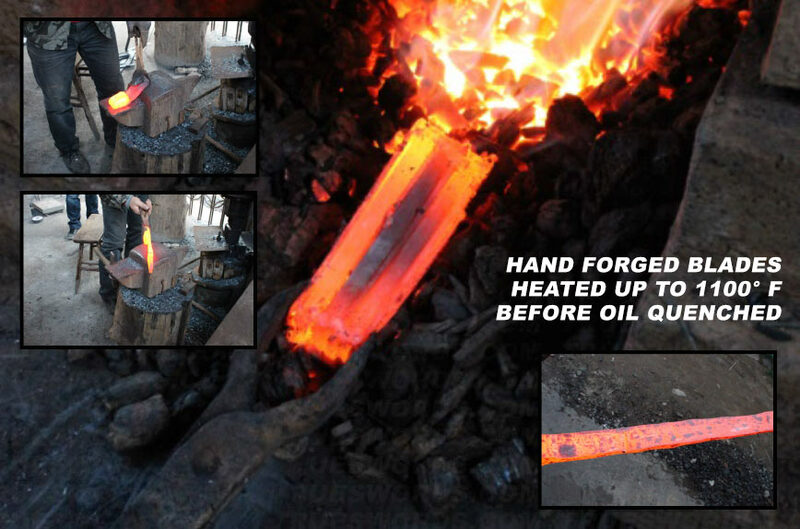 Each blade was meticulously heat forged and hand folded using ancient, time-honored tempering techniques that give each piece a custom, one-of-a-kind look and feel. 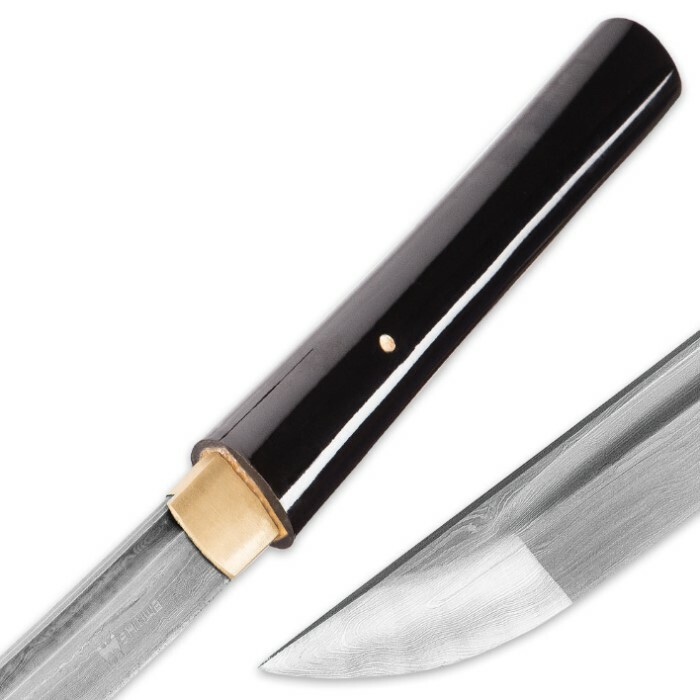 Each one features a hand-sharpened edge and a piercing point just like those carried by warriors centuries ago. Beautiful display piece with what seems to be excellent construction. Simply beautiful. It comes in a nice box. Has a beautiful inlay that shines rainbow colors when it catches the light just right. Solid construction. Sharp and feels sturdy and looks straight. It shipped in 3 days witth standard shipping. I must say I'm pleased with this. Also I love how the blade looks. This sword is beautiful overall. The pearl dragon makes it look absolutely stunning. The box and bag it comes in are simply stunning and I was fairly pleased with the purchase. However I would like to point out that although it looks great and it isn't a super cheap sword, the sharpness is simply non-existent. This sword is not one that you would use to cut anything. For the price I paid I'm not really sure what I was expecting, however I was disappointed that it could barely pierce cardboard or even make a cut in it. I just bought this for my wife. It is super beautiful. I am very impressed. The gift bag I got for a little extra was worth it too. Adds to the authenticity of the piece. I will do business with True Swords again! Thank you guys! I received this sword through the grab and go. And although, of course, it was a little beat up it was still beautiful. The sword is balanced perfectly and you can tell real care went into it's crafting. Truly an amazing weapon. This sword is a beautiful piece of art. Extremely well balanced and very sharp right out of box. For my first big sword purchase over a year ago now, by far is my favorite and most beautiful piece to add to my collection. I look forward to buying another Damascus sword in the near future! I purchased this blade about a week ago for myself and the moment I opened the box I was stunned. 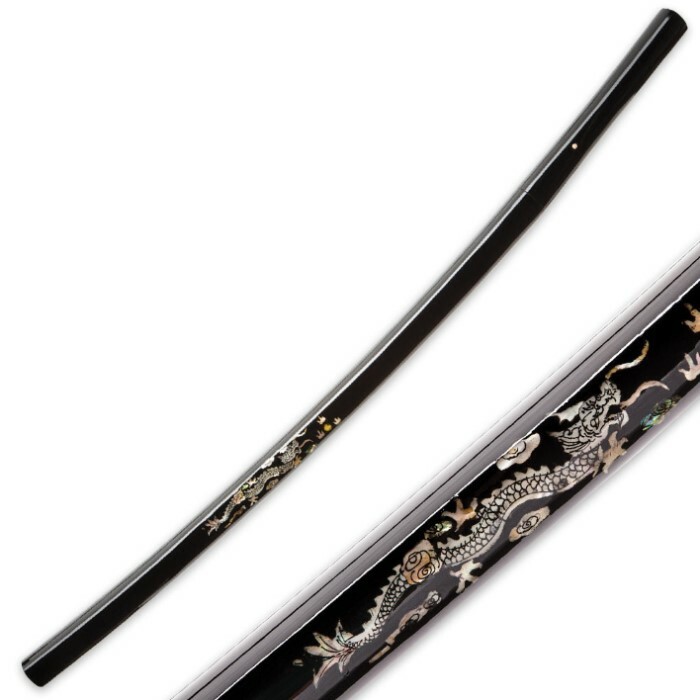 The elegant dragon etched case the sword itself comes in just builds the anticipation of revieling his elegant and beautiful piece. And then in the case it's perfectly wrapped in cloth. The pearl design is truly beautiful and you can't help from gently running your fingers on it for a better look. When I actually unsheathed the blade the dark color just complimented its beauty even further. There were no issues with the blade and I even gave it a routine sharpness test and it was flawless. 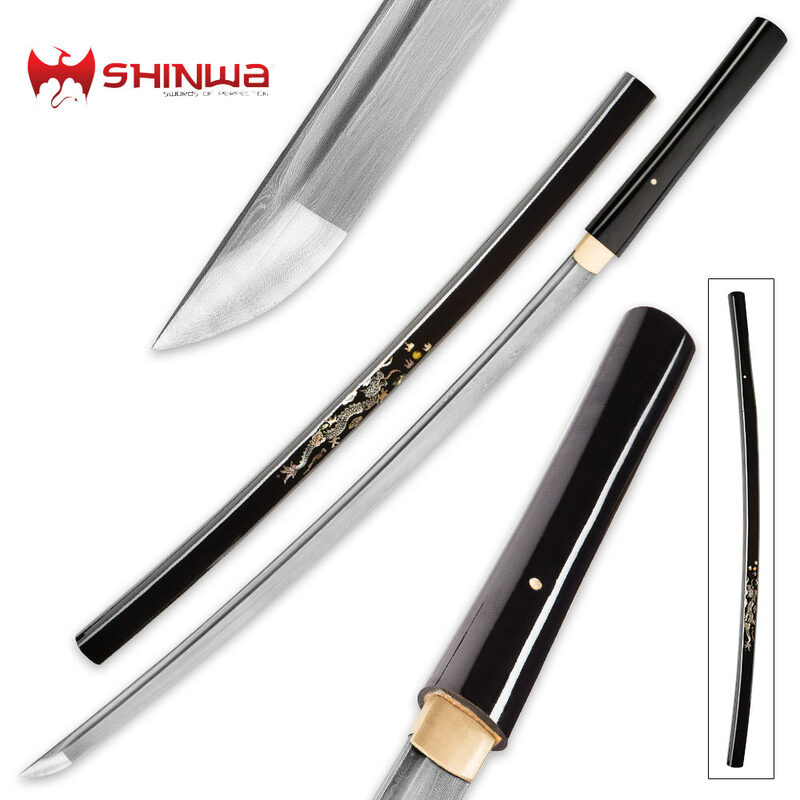 L this is definitely not the first katana I have owned but it was my first purchase through true swords and after seeing this quality craftsmanship and impressive presentation along with fast delivery and great customer service. True swords has quickly found its place as my new source for sword purchases. I was not sure how much I'd like this, but I must admit I'm impressed. This sword is elegant as it is deadly, with a blade that I cut myself on almost immediately. The Scabbard, with it's dragon design, is lovely. The Damascus steel is sharper than I can honestly do justice with words. Also, just a side not, but it comes with a nice box too. Overall, great sword, both as a piece of art, and a weapon. this is a shirasaya not a nodachi. also to johnny hopper, the hole and plug are not rivets that is the hole for the meguki peg to hold the blade in place. the reason there is only one is because this is a sword to be stored. the blade is most likely glued in at the end of the tang. making a nice secure fit. Beautifully made Nodachi with nicely done pearl inlay. The came very sharp and has good balance. It claims to be full tang and from where the balance point is, it would appear to be. The blade is a very tight grained damascus.